You can back up your Session Buddy data anytime by selecting Back up from the Session Buddy application menu. Doing so creates a file containing your saved sessions and settings in your browser’s downloads folder. You can simply leave this backup file in the downloads folder or move it to another location for safe-keeping. 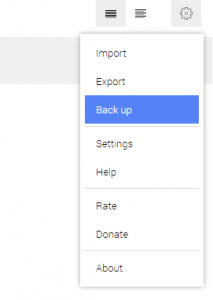 You can create backups as often as you want. A new backup file is created every time you back up. Although unlikely, a browser crash or malfunction can lead to the corruption or deletion of data in a way that makes it difficult or impossible for Session Buddy to automatically recover it. Regularly backing up is a good practice to get into to guard against permanently losing your saved sessions due to such unforeseen events. We recommend you back up often. A backup file can be used to port all of your saved sessions from your current Session Buddy installation to a new one. This is handy when setting up a new computer or reinstalling Session Buddy. Unfortunately, Session Buddy is unable to automatically save backup files. Because of browser security limitations, backups must be initiated by you and can only be saved to the browser’s downloads folder. 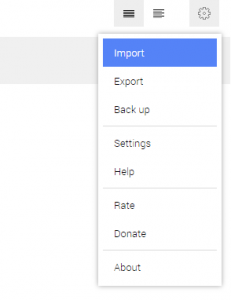 You can restore a Session Buddy backup file into a new Session Buddy installation by selecting Import from the Session Buddy application menu. Once the import status at the bottom of the Import dialog confirms the number of sessions found, click Save to finish restoring the backup. Note that the above steps will add to the set of any sessions already present. Malware attacked my browser, I retrieved them just fine. Also, without reading this, 6 months ago. I actually did this because it was made so easy to do so and all my data got retrieved just fine. Thank you really for this extension. Hello! I've just made a backup and then restore it in a different computer, within a fresh install of session buddy. The problem is that all my old sessions are now shown under "Previous sessions". In particular, I'd like the name of my old sessions to be visible (now each session is simply shown as "Recorded 3 days ago", "Recorded 2 months ago", etc). If I open the json backup file with a text editor, I can still see the name of my old sessions. Is there any workaround for this? Please email me at support@sessionbuddy.com and I'll troubleshoot this for you. What about using: https://developer.chrome.com/extensions/storage so we do not have to move the files manually? There's lots of discussion in the Session Buddy forum on why that unfortunately is not a viable approach. Backups & exports don't work for me. I'm trying to figure out exactly why. I'm using Chrono Download Manager, which doesn't allow to play the download & it displays the message: Server Bad Content. Can't seem to find a way... Any advice, not involving turning on & off my Chrono Download Manager? I want to leave that option as a last resource. I would make sure that Chrono Download Manager is the culprit by disabling it, then trying a Session Buddy backup, then re-enabling it. If you can confirm this, then let me know via support@sessionbuddy.com and I'll file a bug report to address the incompatibility. I backed up and imported my data to a new installation, but my "saved" and "previous" sessions were all imported to "previous." Is there a way to keep these two distinct when moving data to a new installation? I don't have any ideas on what could cause that, but I'd be happy to troubleshoot this for you if you'd like to share the import file. I'll respond to you directly to coordinate that.